Thanks for showing how to make letters out of wire with the twist and style tool.The binding looks lovely with the wire words . Wow! Fascinating process and what a great tutorial! Super fun way to keep track of supplies! So many great tips! Thanks especially for the one about heating metal and applying embossing powder. Thank you. I am glad I could offer something new. Love!!! 😍 Such a great idea for samples! And expandable for when you create new powders! Wow, what a great way to showcase all these amazing products! Love your album! So many great tips too! Thank you Astrid! Good Luck in the hop. Beautiful creation. 174 colors,I am jealous. Thanks for the tips. I enjoy the hop very much and saw beautiful creations along the way. It took me all morning but it was more than worthy. These powders are my new favorite. Love using them and the look they achieve. But more colors? Yes please! Cool journal! I love your embossing powders, they rock!! Wow Kim! 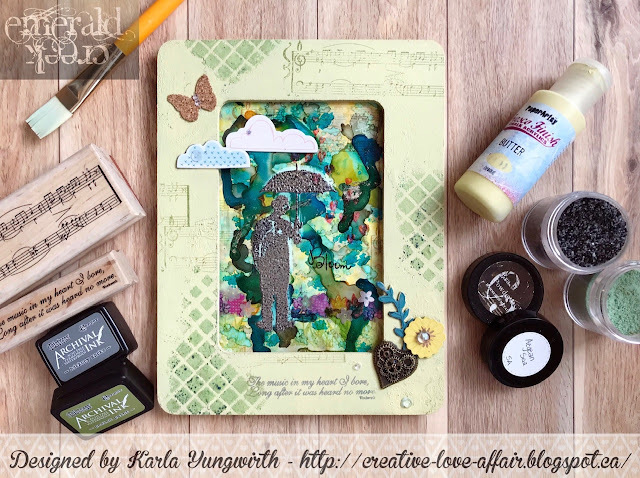 I absolutely love what you did with the layering and drying of paints and powders! So cool! !These types of experiments are so fun, but never turn out exactly the same! lol Great ideas for your signatures with your samples colors(no U) lol I am a HUGE fan of Emerald Creek's powders and so happy that you took over your uncles business- good for you,brave one! Thanks for sharing and bringing this fun hop! On my way to discover more! You left me blushing. Thank you! wow! I have been out of the creative world for awhile and this is the first I am seeing your amazing products! Fabulous stuff, it is making my fingers tingle..perhaps my creative mojo is coming back!! Wow! What an amazing project. I have never seen anything like this. So many great tips in this post. And a gorgeous journal to boot! Looking forward to the rest of the fabulous creations in this hop. Thanks! Thank you Katie and Good Luck! Wire letters!! OMG! Amazing project. Best reaction to the letters so far. Thank you! Kim, what an awesome way to show how your powders work. Fist of all, it is just gorgeous! I would want to pick it up just to feel the textures and see the colors up close. It's also such an amazing reference, I had no idea that some colors are completely opaque while others let the background show through. Fabulous project! Would love to see this in person sometime! Looking forward to seeing all the wonderful projects in the hop! I am praying my luck holds out, cause these are some of my favorite products! An oh I would love to meet you and create together someday Kim! This is a good use of the journal. Love the cover! Amazing use of the journal. I am smitten with your cover. Thanks so much. Thanks for popping by and for all of the support. I will have it at Carnival! What a fabulous way to keep record of colors, finish, effect, and finish...all in one! And, those wire letters, so cool!!! Thank you so much for letting me be part of this!!! This is just amazing! Love the colors and those finishes! So cool! Beautiful! Are there really 167 colors? They all look amazing!I may try this technique with my embossing folders - until I get all of these embossing powders! What a great idea! Thanks for the tips! Fantastic journal and lots of great tips! Thanks for sharing the details! Yay! I get to use a tool I already have. Thanks for the great how-to, love ypur book. Yay, I am excited too. that's the whole point is to give people ideas for what they have! Amazing detail achieved with the embossing powders. Love your idea of using the journal for your samples. I love the great tips with metal. Great book. That is an amazing sample sampler! So beautiful...it totally puts my stamped, embossed paper sheet to shame! Thank you for sharing! Lovely work! I like earthy tones that you have used. Gorgeous! Gonna definitely try that technique of heat embossing after the paint dries because the texture looks very cool! Congrats on the variety of embossing powders! This book is pretty and practical. My favorite combination! Fabulous textures, love the way you created the word 'classic' too . Awesome effects! So much work and care was put into this! Congrats! Those wire letters are awesome! Love the color selection and the use of the sample bag! Love your idea of making sample books. fraction of the cost of bought journals. the wire lettering is fabulous! Good grief! What a make! Thanks for such a great tutorial of every small—and big—detail of this rich, textured journal. Great idea to use as a sample book. I love especially how you used the softness of paper on up to the hardness of metal, esp. Eileen’s twisting tool, to create letters. I love the way you painted your journal! lol And the twisted wire letters. Utterly scrumptious surface texture, and I love the icy colours - a fabulous creation. What an amazing hop - it's lovely to be a part of it. My head is spinning!!! Lots of work but great result! Awesome... love all the tips, especially the twisted wire!! I love this! Thanks for all the technique tips!! Oh my, wire classic !! Absolutely love the texture and colors you created !! This turned out so cool. I like the wire letters. That wire script is awesome! Love it and I must use embossing powders more! You make it look so easy, and the wire script, wow, looks labour intensive. Good detail. Love all the greens and blues on your wonderful cover - and how creative to make wire script letters for the binding! Super cool and gorgeous! I love the amazing texture and fantastic wire work. Love the journal and the tips scattered throughout the instructions; thanks for sharing! Absolutely love emerald creek powders, too! Just WOW! Amazing project from start to finish. Loved how you created your wired word and its placement. Lots to be inspired with - thank you! I agree WOW!! Just an outstanding project. Thank you for the step=by=step. Man oh man you were on a creative roll. It's fabulous! Thanks Chris, you just made my day! Oh wow!! Had to laugh at your shaky start - when I'm in that place I think sometimes its not lack of inspiration but too many possibilities! A bit like I am seeing on this blog hop - need also to come back and check out your acetate work. Lovet he finished project and the great wirework - I fear I am a tad too impatient for that. TFS. One of my favorite all-time blog hops using some of my fave products. It has been so much fun and I love your journal! How fun this looks, new creative mediums for me! Great colors and I like the idea of using black along the edge, makes the rest stand out. I have the twisty tool and useful tip to take print and bend the wire along those lines to make perfect writing in wire! Such an awesome project! I love all the different techniques you used. Love those first couple of steps - so gorgeous! Great tutorial and thx for sharing so many techniques. Wow Kim. Some really cool techniques here and a genius idea to use the journal as a showcase for the powders. The texture you achieved is stupendous! I love this idea for to house samples... has me thinking of all my supplies that need swatching :) Gorgeous final project! Hi Karen, to start you must pick up this tape. I met with one of the original buyers of the tape, she is so experienced and together we learned more possibilities. no other double adhesives can be heated without it peeling back and bubbling. the possibilities are amazing. You have made me smile with all of your comments. Thank you and good luck! Wow Kim! I have been "arting" and crafting for sometime now but I sure learned a few new tricks here today! Thank you for showcasing your amazing project! You have many gifts. Debi, that is such an honour. I have been a private hobbyist for years and I find this so nerve racking. and with this much talent, I think that's why it took days to start. I wanted to make sure I could offer ideas. You made my day. A fabulous way to house samples all in one place. Love the tips/tricks you have so generously shared with us! Excellent touch on the business card, adds a very dramatic looking title card embellishment. I love wrap journals. Great tutorial. Love the embossing method you used. This will be a beautiful sample book. I liked the wire letters on the spine too. Lots of great ideas to try. Great Idea and great album. Love the texture! Thank you for the great embossing ideas. Perfect! What a fabulous result. I love all the texture and your process details are much appreciated! Love the twisted wire lettering! How beautiful is that? I love the twisted metal word and the idea of using it for a sample book. Thank you for sharing. OMG! I love that you made it a sample book and not just an art journal! Awesome idea! I LOVE the texture that the embossing powder created!! Wow well done!! ha love that slow start- me usually too!! "Nothing makes a person more productive than the last minute". So I really love the technique tips especially the emboss powder under the paint, so need to try that. Thanks so much for letting me apart of the hop!!! Wonderful tips and tricks in here! Thanks for the detailed step out too! LOVE the texture and thanks for great embossing tips. Love the textures and colors of your journal. Thanks for the tips on metal lettering and embossing and the difference in embossing powders under paint! very informative! I had no idea there were soooo many embossing powders. Thanks for the great ideas. Love your book cover. Great ideas, like the twisted metal. I have never twisted the wire and made the letters like that! Awesome tip thank you. What a plethora of helpful information!!!! Favorites were twisting the wire and then HEATING the metal and adding the embossing powder... FAB FAB FAB thank you so much for sharing! Very impressive sample book. Love how you used the embossing powders. Fantastic project! Love the tip about embossing metal too. Love your embossing powders, fractured ice and vintage beeswax my favourites! Amazing Kim. Love how you combined the paint colors to get such a gorgeous surface. And what a great idea to use it for s sample book. I love your embossing powders! The color palette on this is glorious! Thanks for the tips! I know that stare!! LOL You really rocked this journal. Amazing colors and genius on your “classic” word!! I am really enjoying the blog hop and I’m so impressed with the creativity on all these sites. I’m picking up some great ideas and tips! Thanks for sharing!! I have never used powders in such a way...great inspiration! What a great sample book. The colors are so fun and soothing. Thanks for all the tips and inspiration. The overnight Charred Gold technique is totally awesome! I love the color and textured look of this journal! Beautiful work. Love love love it! Truly delicious! Super project, and so functional. Thanks for the inspiration! I laughed when reading about staring at the project. i sure do understand THAT! LOL! Your book is beautiful! I especially LOVE your word! Some very yummy texture on the cover! I love the baked textures and the die cuts that you used. Oh yes!! Love it when inspiration strikes like that! Sometimes things have to percolate a bit but then wow what great results! I know you will be getting lots of good use out of this awesome project! Oh, my... I love the fantastic textures on this journal album... the charred gold looks amazing and I also love the wrapped wire word! So creative! Love what you did with the letters! Learned something new today! Thanks! How pretty!! I love the colors you chose and all the awesome texture!